When it comes to primers there's something for everyone. But that can also make it difficult to choose which one it is you need or will do the most for your complexion. 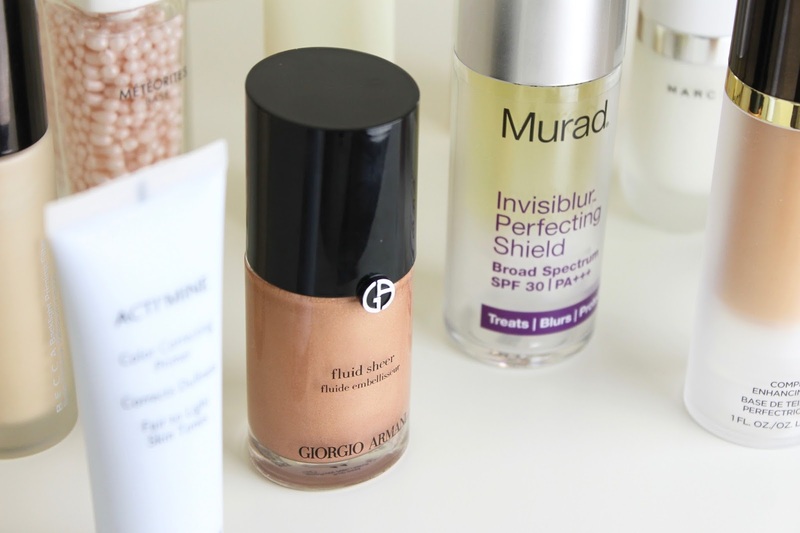 I'm sharing my roundup of favorites and breaking them down into categories to help you decide which best suits your current complexion, while getting you one step closer to the complexion you want. THE MOISTURIZERS - Eve Lom Flawless Radiance Primer SPF 30, Givenchy Acti'Mine Color Correcting Primer, Marc Jacobs Under(cover) Perfecting Coconut Face Primer. Add moisture to a dehydrated complexion while boosting longevity, radiance, and even color correcting thanks to these few amazing formulas. THE WARMTH GIVERS - Giorgio Armani Fluid Sheer in #11, Tom Ford Complexion Enhancing Primer in Peach. My two favorite for pale skin; these both add a touch of peachy warmth - one with shimmer and one without. THE COLOR CORRECTORS - Givenchy Acti'Mine Color Correcting Primer, Tom Ford Complexion Enhancing Primer in Peach, Make Up For Ever Step 1 Skin Equalizer Primer in Radiant Primer Pink. THE RADIANCE INDUCERS - Giorgio Armani Fluid Sheer in #11, Becca Backlight Priming Filter, Guerlain Perfecting Météorites Primer, Charlotte Tilbury Wonder Glow Instant Soft Focus Beauty Flash. Whether you're looking for a strobing companion or an all-over glow giver these are my favorites to get the job done. The Fluid Sheer gives a bit of peachy radiance to a dull complexion, while the Guerlain adds a matte, velvety finish with an added sheen. 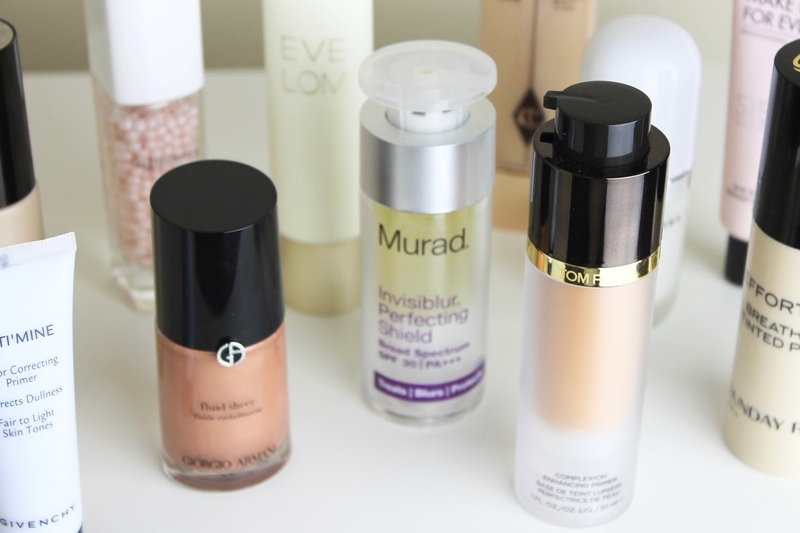 THE SUN PROTECTORS - Eve Lom Flawless Radiance Primer SPF 30, Murad Invisiblur Perfecting Shield. Primers are possibly my favorite way to get a proper dose of SPF on a daily basis, without needing too many extra layers of moisturizer that can sometimes add a white cast. THE ALL-ROUNDERS - Sunday Riley Effortless Breathable Tinted Primer, Eve Lom Flawless Radiance Primer SPF 30. Only want one primer? I don't blame you - it simplifies things and guarantees your makeup stays in place, looking its best all day. Choose from one with a light, tone-evening tint and boost of moisture, or a sheer moisturizer-like primer with added hit of radiance and SPF. Which category of primer do you reach for on a daily basis?